Now I'm not sure if I'm going to accomplish that, but I am at least going to give it a shot. So I designed an inspirational booklet to accompany me throughout the month, for notes, for inspiration, for wordcounts and journaling about anything NaNo related (or not...). I made the booklet freely available via my dropbox (the link to which you can find here). and no, I'm not going to Write About Dragons, though I did get lots of information and inspiration from their YouTube channel. I used the free logo from the NaNoWriMo website for this years participants to add some color and NaNo personality to the booklet. Actualy I used the NaNoWriMo logo through-out the booklet to keep it on theme. Followed by the, oh so, important "Pledge" page, because as they say on the NaNoWriMo website, "Intention is everything". You can add your intentions here and write a little about the book you want to write. The rest of the booklet consists of two pages a day for the whole NaNo month, with some prompts, a word count box and lots of writing related quotes to keep you inspired. The last page of the booklet is the summary page, where you can keep track of your progress and, well, the quote that says it all. Next step would be to actualy think about what I am going to write... and obviously, since procrastination is my middel name (well it could be)..., I decided I needed something other than word to do my actual novel writing with. 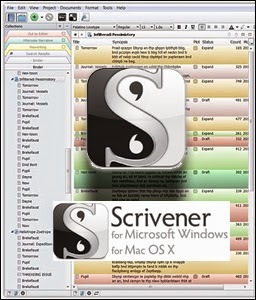 I heard so many good stories about Scrivener so I downloaded it, installed it, imported last year's story into it and started my 30 day trial. After which I will decide if I'm going to continue with it....or fall back to my initial setup....just plain writing in word. So far so good, I'm ready, let the writing commence. Want to join NaNoWriMo for november 2014, here's the link to the website.